The primary reason that an-caps choose the gold standard is the belief they have that the ability of governments to print more money causes inflation. It is this ability to inflate currency on demand that causes inflation. This according to them cannot happen if we have a gold standard. Of course this is not what inflation is. The idea more generally is that an increase in the money supply causes prices to increase. The gold standard supposedly guarantees price stability. From history we can see this is not true. To see why this is we look at the consumer price index. 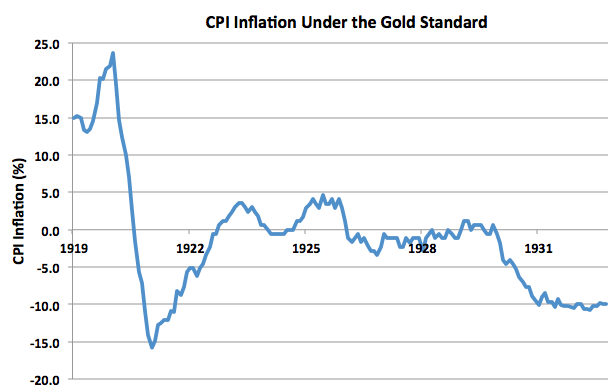 First let us look at CPI inflation during the gold standard period of June 1919 to March 1933. This is most certainly not price stability. Gold has positively demonstrated the opposite here. There are all kinds of reasons why this happens, all of them connected to the inability of gold to adapt to situations. One problem is that the physical stock of gold can’t adjust to alterations in the balance of trade. Currencies don’t just try to avoid inflation; they also try to avoid price deflation too. The effects of deflation in many cases are far worse than those that occur under inflation. Since the an-cap position is based upon the idea that just printing money causes price increases, we should compare this gold with the rounds of “quantitative easing” (or QE) that have been carried out. This demonstrates quite perfectly that price stability is far more viable under a fiat currency. Keep in mind that while both of these charts occur around the time of a crisis, it was the fiat currency that was able to deal with the situation. The lack of an ability to expand currency during the Great Depression is a big component to why it took so long to recover from it. Of course it is not the whole story; I’m not saying it is, rather I’m saying that it is a big part of it. 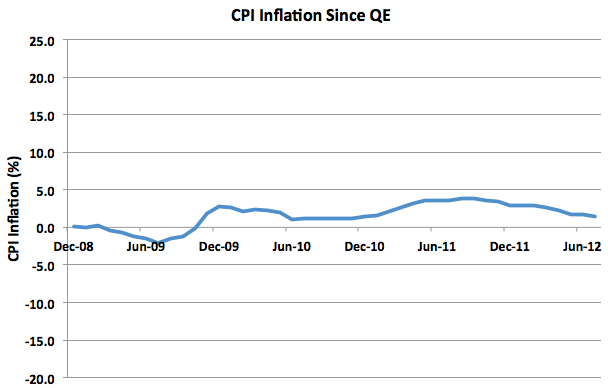 If we were to accept the an-cap belief to be true, then we would be seeing massive CPI inflation after rounds of QE. The Federal Reserve has increased the money supply to heights previously unthinkable. Yet this is clearly not the case. Prices have remained relatively stable; there have been no significant alterations thus far. 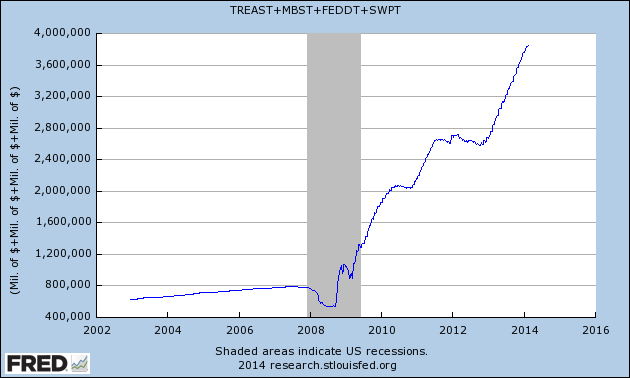 This chart here shows just how much the Fed has increased the money supply. As we can see that is an immense increase. Even with this massive QE, gold still caused inflation variances 23 times that of fiat. A good question one might ask here is how the Fed will be able to absorb all this liquidity it has created. The answer is as simple as the Fed increasing the interest it pays on reserves. It can also enact reverse repos, or use term deposit facilities to stop the banks from lending out too much money. This claim about gold preventing price inflation just isn’t true. There’s nothing to indicate that that it is. There has been inflation over a long period of time. Such a thing is going to happen when you have an expansion of the economy over that long period of time. Is fiat currency perfect? Of course it’s not. Gold is tremendously worse. It has never been a solution to a problem; it has been a cause of them. There is no current problem with regards to price stability; it literally has not materialized as many an-caps have claimed. A return to the gold standard would certainly cause the very problem they falsely believe already exists.